That grand expanse of land taking up the northeast chunk of land of North America, frozen half the time, stretching out almost to touch Russia, is still evolving. There were thriving people carving out a living from the water and land in what’s called Alaska long before the Russians got there in the 18th century and started hunting the sea otter like mad. Its thick fur was so valuable, they hunted the thing out of existence and were happy to sell it to the highest bidder in the 19th century. Though it was just coming out of the Civil War, the U.S. got the upper hand over Canada. The price of $2 million may have raised eyebrows in Washington and rained ridicule on Lincoln’s Secretary of State James Seward. And while he became namesake of a coastal town, he was also forever tagged with “Seward’s Folly” thing. Anyway, it amounted to about two cents an acre, so: good deal. Especially once you get in there. We came the way of many tourists, via a huge cruise ship that set sail from Vancouver and went up the inside passage, which is the name of a way between the islands of the Southeast coast. (The Northeast Passage was the name of the mythical route to Asia that caused all the European explorers up there in the first place). None of the explorers came in ships so big, or so lavish as this. Ours was the Holland America Zandaam (a Dutch name that had me exclaiming “Zan Dam!” from time to time). The marble, the art auctions and the formal dress gala dinners would make you think this was a classy Titanic-type trip (minus the iceberg contact). But because the destination was the frontier land, the most formal some diners could get was collars on a clean shirt, or the good jeans. People who like cruises like this kind of fussiness; but the best part of the boat is the view along the shore as one gets to these little towns: Ketchikan first, where there are a couple of places to see totem pole parks. The one we saw by city bus was all the more sweet. A buck for the ride instead of $60 or so for the big tour treatment (which did allow access to the common house, we later learned; oh well, we snuck a peak anyway). Juneau was a little bigger. It is, after all, the state capital, though the building itself is no more glorified than a downtown bank headquarters and since it was under renovation may have been even more underwhelming than one. There was the Red Onion Saloon on main street, which, beyond the tourist trappings and gift shops, was an interesting, packed bar with afternoon entertainment of a man wailing country music. Most of the commercial strip, as in most ports, were devoted to the kind of things that must sell to those disembarking hotel-sized ships: T-shirts, jackets for those who miscalculated temperatures, fudge, candy, and particularly jewelry. The second big influx of white folks after the Russians made the sea otter extinct was, of course, the gold rush. What glitters more now, though, is zirconium, a fake gem heralded as if a diamond. Our day was booked, though: First a climb to Mendenhall Glacier, or very near it. A four mile trek through the lush tundra forest to some spectacular lookouts. But there was also the first of the overwhelming and alarming decline of the glaciers. Five hundred yards retreated since just last summer. And just a generation ago, it stretched all the way to the waterfall, something now seemingly a half mile away. It was a brisk trek back down the path so as to catch the second tour booked for the day; we were as overscheduled as grade schoolers. But we made it to the bus and over to the whale watching, where the boat captain sped past the traffic around the humpback feedings to get to the more rare orca sightings further away. And there they were, with the blow of their holes, the wriggle of their spine and the flash of their tails. Humpbacks were still there when we returned, engaging in what we were told was the rare bubble feeding, in which they gang up and force foolish little fish to the surface to be consumed (a more cynical tour guide told us later that this was a ploy; they eat like this every day). Nevertheless, not something I’d see often. These guides were funny: They all seemed to be young recent grads of environmental studies in the lower 48 who had a set patter. The Southwest effect is the rule: All must have a set of elaborate jokes, shaggy dog stories or gently scolding snark they repeat on every trip. Only the most deadpan really worked; the worst were those who spoke as if we were all half-bright kindergarteners. Their sing-songy voices were worse than any I had avoided among millennial NPR announcers. Mostly, everybody felt like they had to speak, though. Even the shortest ride came with the requisite headset microphone from the driver and the short biographical profile (imagine if city bus drivers did this every time you clamored aboard: “Hi for those who haven’t heard, my name is Reggie, and I’ve been in D.C. for seven years now; originally from the Ohio Valley. Anybody here from there? Go Buckeyes..”). The next town up, Skagway, seemed to trade a little hard on its gold rush past. The National Parks Service has even come in to take over any storefront not given way to the aforementioned jewels, T-shirts and fudge, to recreate dioramas of saloons long gone, and in the case of one alley, huts where “women of negotiable affection” did their business. There, the train line to the top of a mountain, and all the way into Canada to the Yukon, is something perfectly suited for the sedentary boat crowd. Though the tracks and car design are not so different from the original engines that carried miners to their hopeful riches, I kept wondering whether the gold-mad builders of the turn of the last century were even aware that the track they laid would provide riches for tourism decades later? Did they even notice as they were carried to their claims, that this was some pretty nifty country of mountains, waterfalls and rivers they were cutting through? Was it all a coincidence? Alaska has been jolted by big single minded industries over the last couple of centuries – trapping followed by mining, followed by tourism. But in the last 40 years there has also been drilling, though you have to get off the list of side trips to see the pipeline. 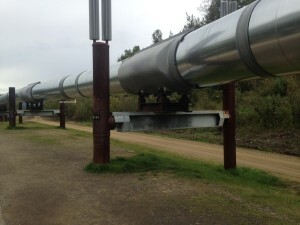 It comes close enough in Fairbanks to have a pulloff along the side of a highway east of town. There is a placard explaining the project that took the oil from the Bering Sea all the way down the state to the doomed port of Valdez. Across the highway is a remnant of the get-rich-scheme from an earlier time: panning for gold. 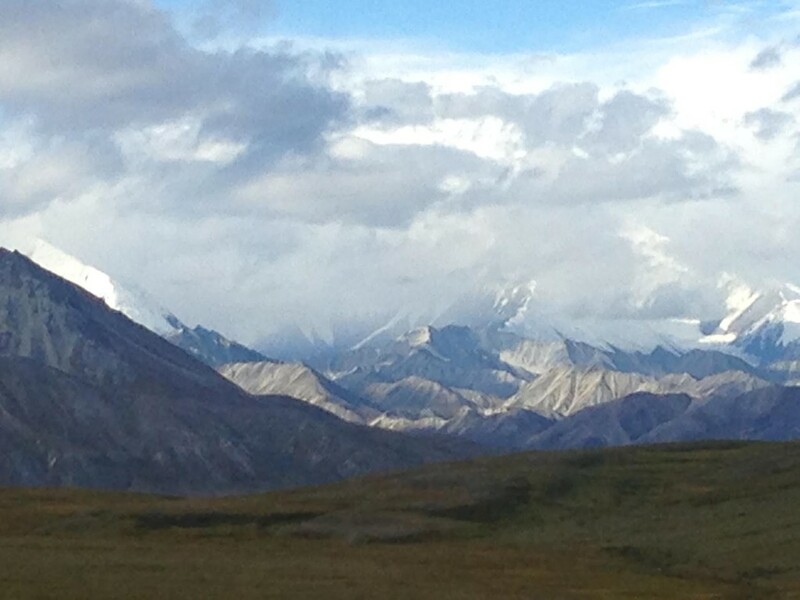 Denali is the main reason to go inland from Seward and Anchorage and north. The previously laid tracks of the railroad also used for hauling coal now hauls tourists up to the park, marking its 99th anniversary in a summer when the National Parks Service as a whole is marking its 100th. it’s awe-inspiring, of course, in part because the former Mount McKinley is so much bigger at 20,000 feet than the neighboring mountains (which are pretty striking anyway). It’s so big that it creates its own weather systems, leaving it in clouds for most of the year. Which is why a parks guy hoisted a sign of what it looks like on a clear day in front of where the peak should have been. He might have done that for wildlife too since my fellow tourists were mad for seeing moose, bear, caribou, eagles or just about anything. They swooned over a swan and even a squirrel at one point. 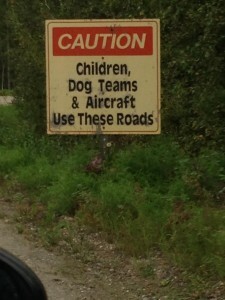 But where were the bears? They were desperate for them! How could they go home without having seen one. Some of the whale watching tours would give you $100 back if they couldn’t turn up any whales. 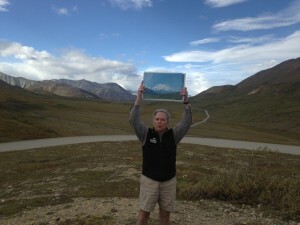 The jaded bus drivers in Denali had no such offer. They did, however, have video cameras. So when they saw a furry spot at the top of a mountain, they’d pause the bus and focus and everyone in the bus would get to see the creatures on video screen. One dude climbed over me so he could take a picture of the video image: He needed to bring something home! But it made one wonder: Did he take pictures of his TV at home, too? Did he have shots of the Olympics to make his friends think he was in Rio? Speaking of which, the timing of the tour came at the exact time of the summer games, but aside from some Canadian broadcasting in Vancouver the night before the launch (where I learned that teams other than America were competing and there were sports other than swimming, gymnastics and sand volleyball), there was no Olympic coverage on the ship other than the summaries given on BBC World News, one of three news outlets on a stateroom set that otherwise offered a lot of ship information on shopping and some movies I was not interested in watching. One was Fox News, the other was MSNBC (which by some sort of agreement couldn’t show commercials on board; so during ad times it was all promos for Chris Matthews, Rachel Meadows, et al. Lots of them. So technically there were bears (grizzlies, not brown bears), caribou, Dahl sheep and one moose alongside the railroad tracks. But none very close. I didn’t mind. I live near a zoo. But I worried about these travelers who anxious to see these prizes that they missed the majesty all around them. Already the fall colors were approaching. Some Aspen turned yellow; the fireweed a deep red and producing cotton (which, meant, in a poem repeated over more than one tourist loudspeaker, “Summer would be soon be forgotten”). It was still quite light out very late, though, allowing evening river rafting down slate-colored glacier rapids. I could have sworn that our guide deliberately caused major splashes at my expense — glacial facials, they love to say — but I didn’t mind being the fall guy. But it was chilly and quiet and beautiful any way you looked. By the time we got to Fairbanks we couldn’t see the northern lights, which we were told do come out this early in the season. But it only meant we’d have to return. This entry was posted in Personally Speaking. Bookmark the permalink. Both comments and trackbacks are currently closed.